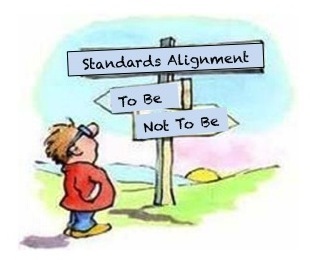 Home » About Our Blog » To Be or Not to Be: Are Publishers Aligned to Standards? To Be or Not to Be: Are Publishers Aligned to Standards? 88% of the Texas Essential Knowledge and Skills (TEKS). Thus, there was an average gap of 13 percentage points between publishers’ claimed alignment percentage and the alignment percentage determined by Learning List’s independent reviews. The largest gap was 50 percentage points for Common Core materials and 32 percentage points for TEKS materials. Learning List reviews instructional materials from the educators’ perspective, looking for alignment to the content, context and cognitive demand (or performance expectation) of each standard. Having already reviewed hundreds of instructional materials for alignment to both the Common Core and Texas Essential Knowledge and Skills, our experience corroborates that most publishers do a good job of aligning their materials to the content of the standards (what students are expected to know), but do not routinely ensure that the material also addresses the cognitive demand of each standard (how the students are expected to demonstrate their knowledge) at the requisite level of rigor for the grade level. Hence, that is the most significant reason for the discrepancy between the publisher’s claimed alignment percentage and the percentage determined by Learning List. So, prior to purchasing any instructional materials that span multiple grade levels, it would be wise for schools and districts to review the material’s alignment to each grade level’s standards.